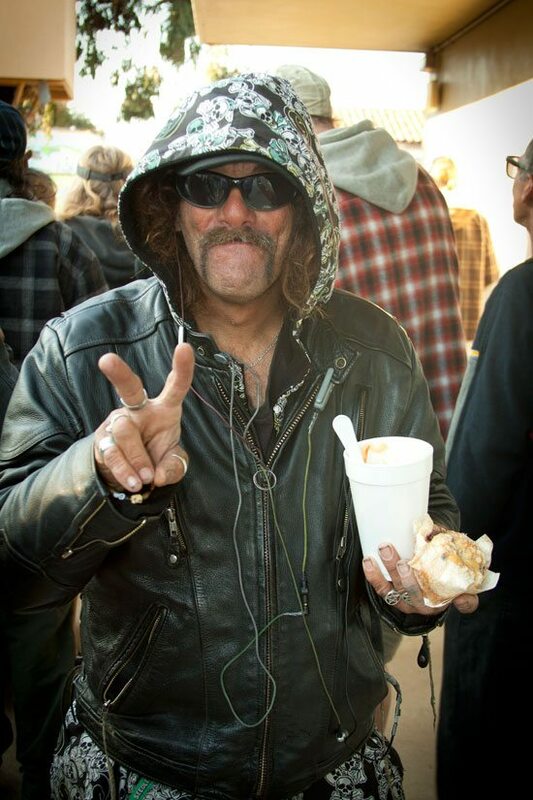 The Point In Time Count (PITC) of the homeless surveys were conducted this morning in Ocean Beach. As my alarm went off at 6am, I thought to myself, “what am I doing up at this hour? why did I commit to reporting Part 2 of 2 in this series on the Point-In-Time-Count?” It suddenly didn’t seem like my brightest idea to date. Yet, after what I witnessed today it was well worth the early wake up call. By the time I arrived at the First Baptist Church at 7:30am where the surveys would be conducted, I was freezing and wishing I had worn my toe socks. Glyn Franks, President of Second Chances, Inc. greeted me with a broad smile and warm welcome. He and several energetic and upbeat volunteers were preparing the weekly Saturday morning breakfast for those without resources for food. What I observed the people of Second Chances offering with such compassion, kindness, and non-judgment is a heartwarming story in itself, For now, allow me to simply express my thanks and appreciation to all who selflessly gave their time and talents to nourish and nurture others. As people began to arrive for breakfast, there was a quiet calm in the air. Oh yes, it was cold this morning, yet I heard no complaints. There was quiet chatter amongst the folks while they patiently waited to either serve or eat. As more and more folks arrived I began seeing familiar faces, people I’ve seen around town in passing. Seeing so many gather in the cold for a meal jarred the rose colored glasses from my eyes. I began to realize the magnitude of the homeless population in OB. And these were only the ones who got up early today to come and eat perhaps their only meal of the day. Once people had a chance to eat, Tim Sandiford, Regional Volunteer Coordinator, PITC, was ready and waiting with the 15 minute surveys, offering any participant a $10 gift card to Subway or Jack in the Box as a way of saying thank you. While participation was strictly voluntary, not many in attendance passed up the opportunity. While I wouldn’t dream of revealing any personal responses from those that participated, I can speak on the categories covered and questions posed…and, of course, my life’s lesson from it all. 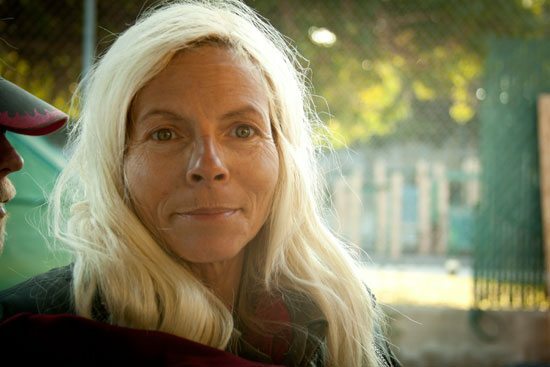 Next, there were a few questions specific to their experience of being homeless in San Diego. 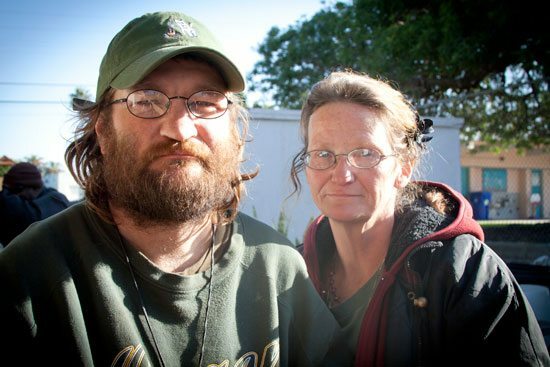 Questions such as how long they’ve been homeless here, where were they before coming to San Diego, have they been a crime victim while homeless in San Diego…stuff like that. The questions that really intrigued me, though, were the ones that gave a voice to the individuals experiencing homelessness. Each person surveyed had an opportunity to reveal what led up to them becoming homeless? What, if any, services they’ve accessed in the past 6 months? What services they need right now? and what services would they need to no longer be homeless? Okay, stop right here, I’ve got to say it … This is a BRILLIANT idea here, folks! Ask the people who are actually homeless what they need. Not only for today’s survival but also looking forward to what they would need to no longer be homeless (if that’s even a goal for them). As I see it, the PITC surveys don’t put the cart before the horse. Data from these surveys will serve to discover the real needs of the people in this area who are experiencing homelessness BEFORE funding programs in this area. Someone is thinking solutions here (collective gasp!)! All kidding aside, this really is a good idea. well thought out with easy application. Is this person available in 2012? These survey questions did not appear to be just another exercise in futility posed by yet another agency gathering statistics in order to fund their own agendas. It became apparent that someone spent a lot of time developing these questions and really thought about their intended audience. I could easily imagine how, when used correctly, these results held the power to actually change lives. I’m feeling really good about what I saw in OB this morning. Another instance of people doing something instead of the all too familiar albeit fruitless bitchathons. Here were very nice people working together toward a common goal ~ one that benefits us all. I am once again encouraged by seeing Obceans come out into the community and make a difference in the lives of others. My hat is off to you all ~ both those that live indoors and those that do not. To quote Tim from part 1 of 2 in this series, start asking yourself ‘what do I have to offer?’ Here’s an easy one we can all offer. All this week you can encourage anyone you know currently experiencing homelessness to take part in a PITC survey. A simple mention of the no-strings-attached $10 gift card may encourage their participation. The more results collected, the greater the potential to get the tangible and much needed assistance directly to our (larger than I ever imagined) homeless population. 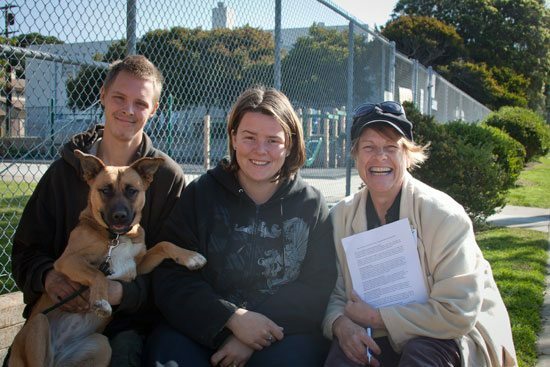 Surveys are being conducted all this week by PITC volunteers and are open to anyone currently experiencing homelessness. Another scheduled opportunity to complete the survey in Ocean Beach is Saturday, February 5, at the First Baptist Church on Santa Monica (just east of Sunset Cliffs Blvd) during the Second Chance breakfast at 8am. Yep, that’s REAL early, yet oh so worth the effort. Results of the Point-In-Time-Count that took place last night are expected in about a week. As to when the results of the surveys are expected and to whom results will be available, I am uncertain. Any inquires regarding the survey results should be directed to the Regional Task Force on the Homeless. This article was updated with photos on January 31, 2011. I would so love to hear some of the stories about how/why some of these folks ended up on the streets of OB. I’m hoping to hear something that eases me away from my current feelings of intolerance. It is getting more and more difficult to look at these folks without being angry. Sarah- I suggest you seek professional help. If you find it difficult to look at “these folks” without getting angry its indicative of something quite different from intolerance . Oh Danny, I’ve been seeking professional help for ages. You should have seen me before the drugs kicked in. It’s been an ugly week on the street/boardwalk/seawall and I won’t bore you with the details. Rest assured that I do not paint with a broad brush but neither am I willing to turn a blind eye to reality. perhaps you could read Ernie’s article “Reflections From an Evening with my Home Girl.” (OBRag 1/30/11) He brings up a very good point that applies to your “intolerance”. when i developed and created an Anger Management class at The Harmony Center, I explained to folks that anger, like any other emotion, is energy. Left unchecked it can quickly become rage. that’s, perhaps, what most of us are all trying to avoid. Anger can be utilized to inspire action. As frustrated as you may be with “those folks” behavior, your intolerance will not change anything. Channel your energy into positive action and you’ve found a winning direction. 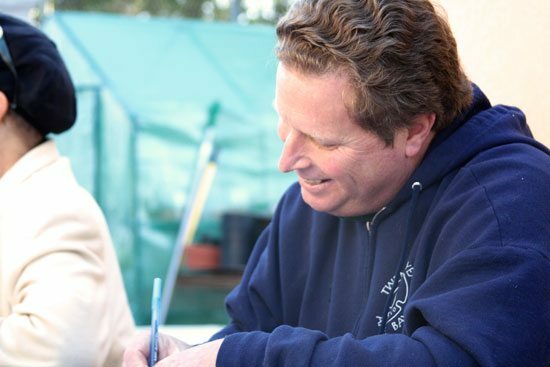 In other great news this week, the Waterman David Ross and the Isaiah Project’s Gerry Limpic will be opening the Waterman’s Check-In Center for the Homeless at 917 9th Avenue in downtown San Diego this week or next. The city-owned building is located across 9th Avenue from the San Diego Public Library and between Broadway and E Streets. The new Storage Facility for the Homeless is based upon an existing project in Los Angeles, and is being done in cooperation with the San Diego Police Department. Hi Sunshine, Great articles. Thanks for sharing the information. your welcome, la playa. i enjoy going out into the community and being a part of the solution. I’ll keep an eye open and an ear to the ground on what happens as a result of the PITC and PITC surveys. Update: we have added some great pictures by Brittany Bailey to Sunshine’s heartfelt post. Thank you both! thanx for adding the photos, patty. Great shots, Brittany, who was out there real early with the rest of us clicking away. her ability to capture the upbeat mood of the morning in the faces of those attending is right on. Thanks, guys! Thank you for inviting me out to take photos- it was an amazing, eye-opening experience. Thank you for your support of the Point-In-Time Count (PITC) and for your very thoughtful coverage. At the RTFH, we believe ending homelessness. It is very hard work. When we move beyond judgment, scorn, pity (and a myriad of other feelings) and move towards empathy, caring, and action, we are on our way to finding solutions – one person at a time. In the end, we all win when people leave the streets. The Regional Task Force on the Homeless (RTFH) manages the county-wide Homeless Management Information System (HMIS). The HMIS is used by service providers to support their case management, to track persons served, to refer individuals and families to critical resources, and to gather and analyze key demographics and trends. The RTFH is San Diego County’s data center and technical resource for information on homelessness. We support, empower, and collaborate with San Diego County’s homeless service providers on a myriad of issues. The RTFH provides technical assistance, training, research, and critical data reports to many stakeholders: service providers, cities, the County, elected officials, and U.S. Department of Housing and Urban Development (HUD). We conduct the annual ‘Point-In-Time’ Count (PITC). Mandated by HUD throughout the country, the PITC provides our region with critical insights into understanding the scope, trends, and impact of homelessness. Working together, we can better understand homelessness, develop best practices and ensure sustainable solutions that enable people to become housed. Peter, i am again surprised and thrilled to receive your comments on my coverage of the PITC. As I researched these articles I began to see the magnitude of your undertaking. at least 35 different organizations are listed on your online pdf, and these efforts have been going on since the 80’s. there are many housed residents of OB that simply do not know what to do, They have become frustrated by the increasing population of homeless people (more likely the behavior of some), and as one of the above commenters stated, “becoming intolerant” of even seeing them day in and day out..
My direct question to you, Peter, is: What can homed people do TODAY? Please, if you can, tell us all some specific actions you recommend. 1. Advocate: By this I mean be very vocal with your elected leaders and other media. It takes political will/courage to accomplish much of what we are after: more affordable housing, support services for those in need, emergency shelter funding, and more. If services (drop in center, a service provider, etc.) are desired in O.B., it takes funds. Our ‘electeds’ have the power and influence to direct a certain amount of funds based on need. Now that we know far better what the need is in O.B., we have the data to back it up. 2. Listen: The surveys enable us to learn about those in our community. Homeless is not a crime, it is a symptom of other issues. Once we understand, we can then work far more effectively to reintegrate people in our community. You are welcome and encouraged to interview everyone – however, we only have enough gift cards for about 15%. If local vendors can provide more support, please reach out to them. 3. Support: You have a great community of concerned citizens who want to make a difference. Supporting your feeding programs and other efforts is critical in order to stay connected with those without homes. 4. Persevere: Homeless is solvable. It takes time, caring, and permanent supportive housing. Check out this link – proof that it can be done. This effort is underway in San Diego and I am very optimistic that we will have similar results. We had a downtown Registry Week in September of 2010 and we are on our way to housing 125 of the most vulnerable people. The need is great. Our community is greater. I also wanted to personally thank you for your support of the Point-in-Time Count (PITC)! With your help I believe we have mobilized enough volunteers and are having one of the most comprehensive and accurate PITC’s to date! Thank you, thank you, thank you, OB! Tip of the hat to YOU Sunshine. Well done! thanx annagrace. I always appreciate your support. i realize one person can not end homelessness by themselves ~ none of us can individually. Witnessing the community come together to help make a dent was inspiring. It was good to see what tangible actions are underway in our community (and across the country) that directly address this national issue. homelessness is not a crime and many of those who are homeless in this community simply had no other option. Far too many people are one paycheck away from homelessness. Anything any of us can offer to help those without homes may come back to help us if and when we find ourselves in the same situation. Nice to put a face to your name now, and your names fits you. Thanks so much for your volunteering and writing a wonderful report.